Meat Loaf’s quintuple platinum-certified 1993 album, Bat Out of Hell II: Back Into Hell, and his platinum-certified 1995 album, Welcome to the Neighbourhood, will make their U.S. vinyl debuts with new 2 LP vinyl editions to be released worldwide on February 8th by Geffen/UMe. In the U.K., both albums are making their first return to vinyl since their original release. 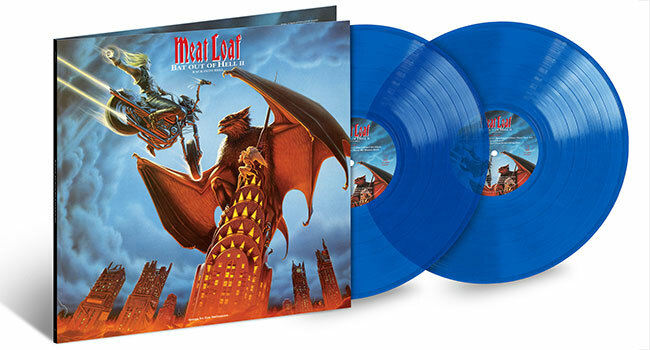 Bat Out of Hell II: Back Into Hell is available now for pre-order on black and limited edition translucent blue 2 LP vinyl. Welcome to the Neighbourhood is available now for pre-order on limited edition black 2 LP vinyl. Released 25 years ago after studio sessions spanning two years, Meat Loaf’s sixth studio album, Bat Out of Hell II: Back Into Hell was the highly anticipated sequel to one of the bestselling albums of all time: his blockbuster 1977 debut, Bat Out of Hell. Revisiting the themes of its 14-times platinum-certified predecessor, Bat Out of Hell II returned Meat Loaf to the top of several charts around the world, fueled by its GRAMMY-winning international smash single, “I’d Do Anything For Love (But I Won’t Do That),” which hit No. 1 in 28 countries. Meat Loaf’s first two Bat Out of Hell albums were written and produced by the GRAMMY-winning songwriter and producer Jim Steinman. Meat Loaf recorded Bat Out of Hell II from 1991 to 1993 at Ocean Way Recording in Los Angeles and at Power Station in New York. The album features many of the same musicians from the first Bat Out of Hell album, including Roy Bittan on keyboards and piano, as well as Todd Rundgren, Ellen Foley, Rory Dodd, and Kasim Sulton returning for background vocals. Meat Loaf’s seventh studio album, 1995’s Welcome to the Neighbourhood, is a concept album, weaving a narrative about a relationship over time. With three singles — “I’d Lie for You (And That’s the Truth)” (a duet with Patti Russo), “Not a Dry Eye in the House,” and “Runnin’ for the Red Light (I Gotta Life)” — the album achieved platinum sales certification in the U.S. and U.K.